BOSTON – Patricia “Pat” Vincent-Collawn, chairman, president and CEO of PNM Resources, today was elected chairman of the board of the Edison Electric Institute (EEI), the national association of investor-owned electric companies. Also elected today were three vice chairmen: Christopher M. “Chris” Crane, president and CEO of Chicago-based Exelon Corporation; Gregory E. “Greg” Abel, chairman, president and CEO of Des Moines, Iowa-based Berkshire Hathaway Energy; and Lynn J. Good, chairman, president and CEO of Charlotte-based Duke Energy. The announcement was made during EEI’s annual convention in Boston. The Institute’s chairmanship rotates on an annual basis, and Vincent-Collawn replaces Tom Fanning, chairman, president and CEO of Atlanta-based Southern Company, as EEI chairman. Pat Vincent-Collawn has more than 20 years of experience in the electric power industry. Before joining PNM Resources in 2007, she served as president and CEO of Public Service Company of Colorado, a subsidiary of Xcel Energy. Prior to that, Vincent-Collawn worked at Arizona Public Service. Vincent-Collawn serves on the boards of CTS Corporation and Nuclear Electric Insurance Limited, and is past chair of the Board of Directors of the Electric Power Research Institute. In addition to her professional affiliations, Vincent-Collawn is involved in a variety of community activities, serving as Chair of the New Mexico Partnership and on the board of the Economic Forum of Albuquerque. Previously, she served as Chair of the Kirtland Partnership Committee, the Greater Albuquerque Chamber of Commerce, and the United Way of Central New Mexico. Vincent-Collawn holds a bachelor’s degree in journalism from Drake University, and an MBA from the Harvard Business School. Chris Crane is president and CEO of Exelon Corporation, where he oversees a family of companies representing every stage of the energy value chain, including Exelon Generation, one of the largest competitive U.S. power generators; Constellation, a competitive retail and wholesale supplier of power; and six utilities delivering electricity and natural gas through Atlantic City Electric, BGE, ComEd, Delmarva Power, PECO and Pepco subsidiaries. Exelon has business operations in 48 states, the District of Columbia and Canada. Crane joined Exelon, which was then ComEd, in 1998, and was named chief nuclear officer in 2004. He later served as Exelon president and COO, where he oversaw the company’s portfolio of electric generating capacity and directed a broad range of business operations, including major acquisitions, transmission strategy, cost-management initiatives, oversight of major capital programs, generation asset optimization, and generation development. Prior to joining Exelon, Crane served as Browns Ferry site vice president for Tennessee Valley Authority, and worked in new plant start-up at the Comanche Peak Nuclear Power Plant in Texas and Palo Verde Nuclear Generating Station in Arizona. Crane is chairman of the Institute of Nuclear Power Operations, and an executive committee member and immediate past chairman of the Nuclear Energy Institute, the nation’s nuclear industry trade association. He also is a member of the board of directors of the Economic Club of Washington, D.C., and AEGIS Insurance Services, and served on the board of governors of the World Association of Nuclear Operators. Crane studied at New Hampshire Technical College and attended Harvard Business School’s Advanced Management Program. Abel serves on the boards of the Kraft Heinz Company, AEGIS Insurance Services, Inc., Nuclear Electric Insurance Limited, Kum & Go, L.L.C., and the Hockey Canada Foundation. He is a member of the executive board of the Mid-Iowa Council Boy Scouts of America, and a past member of the American Football Coaches Foundation and the Drake University board of trustees. Lynn Good is chairman, president and CEO of Duke Energy. 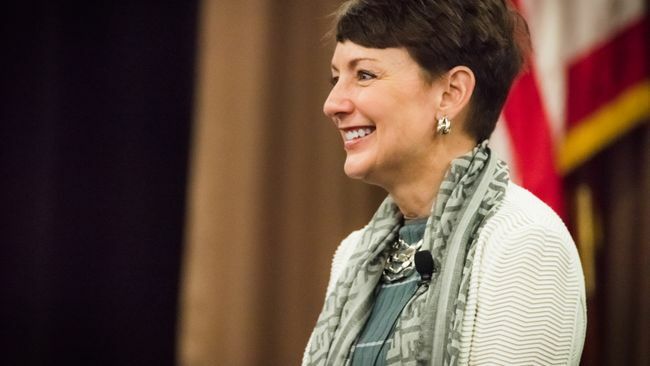 Before becoming CEO in 2013, she served as Duke Energy’s CFO, and earlier led the company’s commercial energy business. She began her career in the electric power industry in 2003 with Cincinnati-based Cinergy, which merged with Duke Energy in 2006. Prior to 2003, Good was a partner at two international accounting firms. Good is a member of Boeing’s Board of Directors and serves on the company’s audit and finance committees. She is also a board member of the Institute of Nuclear Power Operations, serves on the executive committee of the Nuclear Energy Institute, and is a member of the Business Council and Business Roundtable. Good serves on the boards of the Bechtler Museum of Modern Art and the Foundation for the Carolinas in Charlotte. Good holds bachelor of science degrees in systems analysis and accounting from Miami University in Oxford, Ohio.